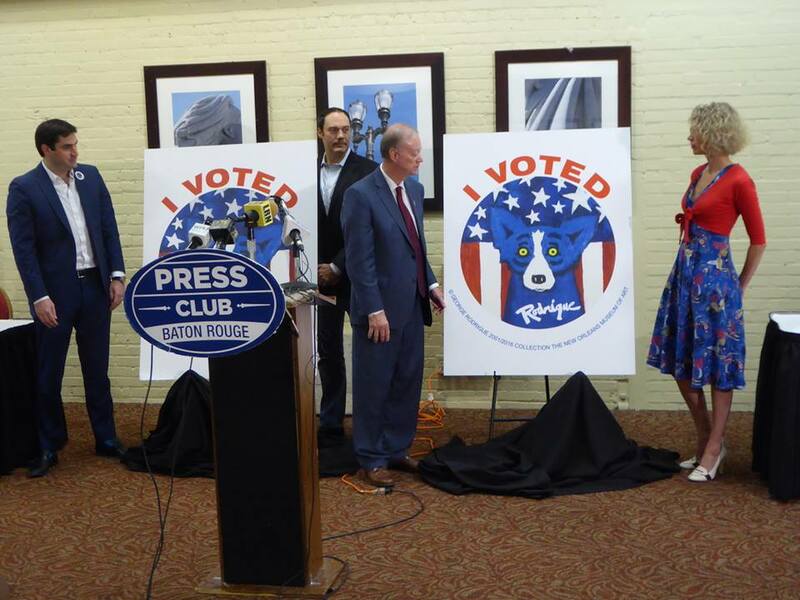 George Rodrigue’s family joined Louisiana Secretary of State Tom Schedler on October 12, at the Baton Rouge Press Club and the New Orleans Museum of Art unveiling a statewide “I VOTED” sticker for distribution at the polls next month* (including early voting). From left: George Rodrigue’s sons, Jacques and André, Secretary of State Tom Schedler, Wendy Rodrigue. The artwork is a painting by George Rodrigue titled “Stand Up Straight and Tall” (2001) from the collection of the New Orleans Museum of Art. George Rodrigue painted “Stand Up Straight and Tall” in 2001 as part of a series of patriotic works following 9/11. Thanks to the generosity of Henry and Pat Shane of Kenner, Louisiana, the painting belongs to the permanent collection of the New Orleans Museum of Art. News of Louisiana’s special “I VOTED” sticker based on George Rodrigue’s painting hit newspapers and TV stations across the country this week. *Please note: The “I VOTED” sticker is only available at the polls, and not available for purchase.